Ha. Things have been going great! Work has been N U T S. I’ve been working 7 days a week since the beginning of June. It’s a darn good thing the second trimester has been so great! 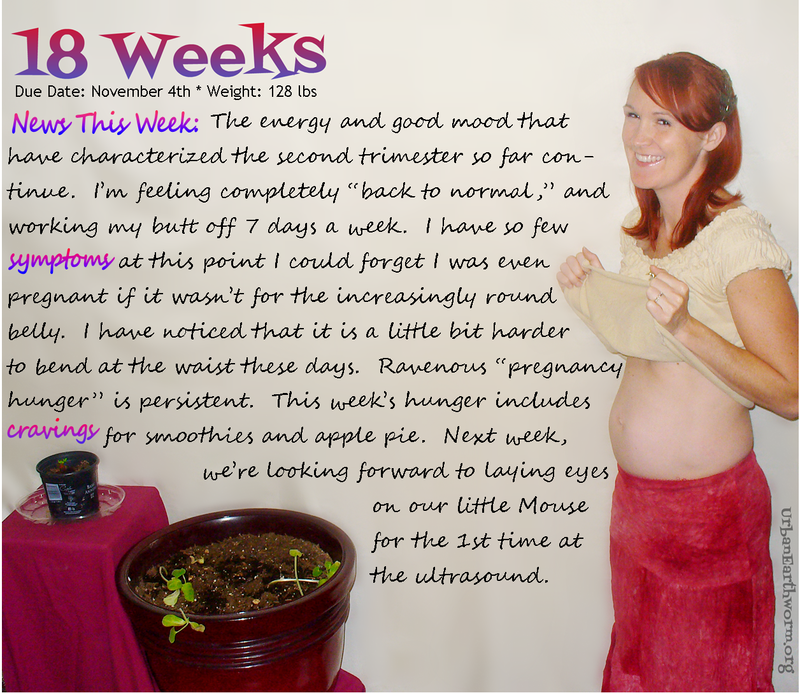 There has been very little going on with the pregnancy, so to speak. The belly is certainly starting to pop, but that’s about it. Heartburn and slight nausea when I lie down, but even those are pretty rare. Sudden onset of rampant hunger is really the strongest symptom, though it hasn’t been much of a problem. I was actually starting to worry because I didn’t gain any weight for 2 or 3 weeks, but it looks like I weigh a little more this week. 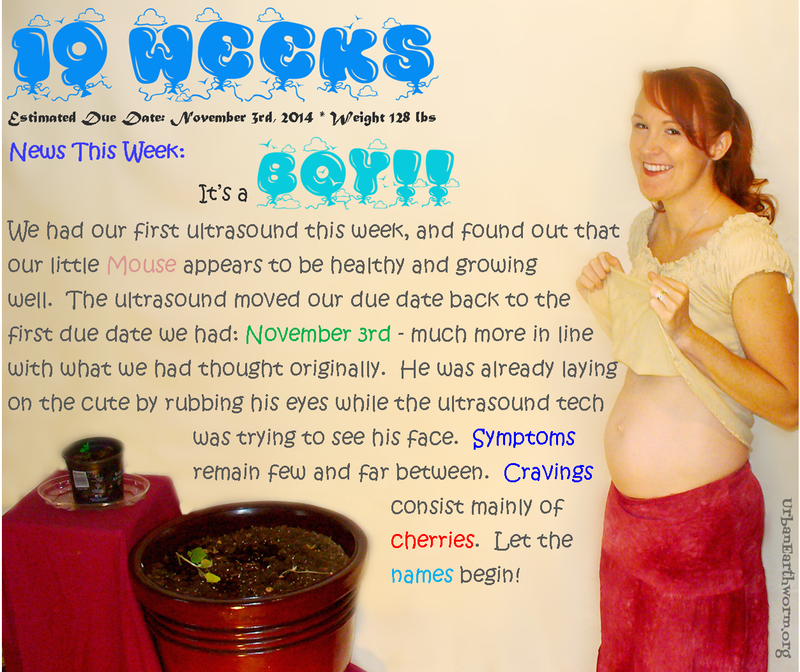 I’m at the end of week 20 right now – just passing the half-way mark in my pregnancy. Feeling lots of little swipes and flutters, and I can’t wait until they get a little stronger and MacGyver and the kids can feel them. MacGyver has felt it once or twice, but it’s hard to catch. Flintstone is very interested in the whole process. Just today he said he was going to go back inside my belly so he could say hi to the Mouse. My best friend (who just gave birth a few days ago! Squee!) said Flintstone clearly watches too much Magic School Bus. ha. Probably true. (But it beats Mickey Mouse any day). And we found out it’s a boy! I honestly didn’t care much either way, but I was totally shocked. I think I had just assumed it was a girl based on the dream I had earlier on in pregnancy. I’m really excited that Flintstone will have a little brother to play with! Punky is a bit less thrilled. Guess that just means we’ll have to have another! And if that one’s a boy, too, no problem! I thought him being a boy would make naming a lot easier. We plan to name him after my younger brother, Boo (who’s real name was Scott). We lost Boo to a drunk driver 2 years ago when he was 25 years old. He was the best uncle in the world. Now, though, we are having a heck of a time coming up with a middle name. His first name is rather traditional, so we’d like something a little more unique for his middle name, and it has to have 2 or 3 syllables. Alright, it’s time for me to have some fun with the kids outside my belly!